Satyamma’s Husband died about 20 years back.He worked as a tailor and Satyamma used to help him in his work. Now she is living with her widowed daughter Anatha Laxmi, who also lost her husband and son. They are living in rented room in a slum area.Satyamma is not able to do any work due to old age and eye sight problem. Satyamma’s daughter is not able to earn much to feed her mother. Her life has become more miserable as she is not able to get a square meal a day. Under these circumstances,Sahara NGO came to the rescue of Satyamma by supplying required food materials,toiletries and pocket expenses from the donors who adopted her.She is now living happily. With this adoption program Sahara could reach maximum number of uncared aged in the community. Sahara NGO was established in the year 1986 in Hyderabad and registered in the year 1988 under Public Societies Registration Act and registered under FCRA. It has a General Body and Executive Committee. The members are from different background such as Doctors, Engineers, Lawyers, Social Workers, and Businessmen and from different walks of life. The founder members, who are from middle class background had come up in their life with lot of hardship and struggle and felt the need of helping others who are now struggling to come up in their life, especially underprivileged and socially victimized sections of the society, the poor and needy. MISSION To serve the poor and needy especially in rural areas/urban slums enabling them to come up in their life. To empower women, support aged and to play a catalytic role for education and development of poor children, uplift of underprivileged communities, awareness of health and hygiene and protection of environment. Please click here to view the annual statements of Sahara NGO for the year 2011. Bollu Sravanthi is the elder daughter of the Bollu Bheemayya and Rajamani. Sravanthi has two sisters and one brother. She has completed her SSC in the year 2004 and scored good marks. She thought to continue her education but the family’s income is not sufficient to send her for higher education. Her father is a weaver. As he cannot get more work in this area, he went to Bheemandi for job. They are staying with her grandparent’s house. Her mother is a labour and she has to feed entire family including grandparents. After stopping her education, she started beedi rolling and earning about Rs 500 per month and supplementing the income to the family by facing lot health hazards by doing beedi rolling work. The mother of Sravanthi said that it is a compulsory for all the girls in the area/ district to roll beedis, other wise no one will marry the girls if they don’t roll beedis. The more they roll and earn more they get selected faster for marriage. But no one cares or thinks about the health hazard of the girls. When sahara started VTC with the support of Concern India Foundation-, she came and joined the course. We have given the admission to the candidates those who are working in the beedi industry after thorough counseling. Our staff has met her parents and grandparents to create awareness on this health hazard ness in beedi rolling and asked them to send the girl regularly to the center. She has completed her one-year course and started stitching clothes at her home to near and dear ones in the beginning and picked up the quality in stitching. Now, she has brought a second hand machine and running a tailoring shop in her own house. Now she is earning Rs. 1000 pm as additional income through tailoring work. She is approaching her teachers, if she has any doubt while stitching. Teachers are also helping this girl by giving job work of hemming, stitching falls etc. But her grandmother is not satisfied with the tailoring work. She expressed her view as if she does not want to do the beedi rolling, they have to pay more money as dowry. It is a custom in this society that a girl child should learn the beedi rolling for the family. Now, has changed it by making an alternative income by doing tailoring work which protects their health by not doing beedi rolling. Satyamma’s Husband died about 20 years back. He worked as a Tailor and Satyamma used to help him in his work. She is living with her widowed daughter Anatha Laxmi, who also lost her husband and son. They are living in rented room in a slum area. 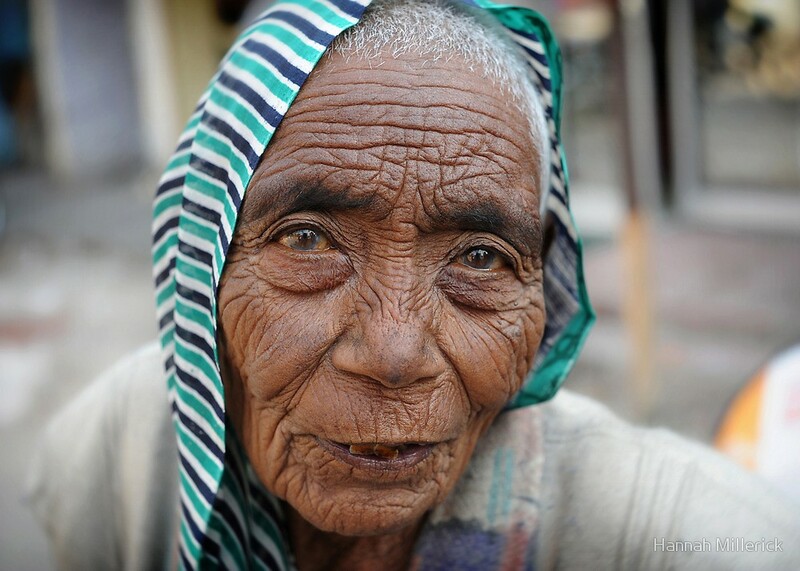 Satyamma is not able to do any work due to old age and eye sight problem. Satyamma’s daughter is also not able to earn much to feed her mother. Her life has become more miserable as sshe is not able to get a square meal a day. Under these circumstances, Sahara could able to come to the rescue of Satyamma by supplying required food materials, toiletries and pocket expenses with the donors who adopted her. She is now living happily. With this adoption program we could reach maximum number of uncared aged in the community. Angelina is studying 3rd class (2012-13). . Her mother Quene died in the month of Sept’11 in a quarrel with her father –Isaq. Later her father was absconding and not known where about. She has two more sisters - Jesica and Jerusha. Now they are staying with her maternal aunt. They are also poor and not able to care these children due to meager income. They have no other income source to meet the extra burden of these children for their studies and maintenance and she became a school dropout. Seeing their plight and the pathetic situation, someone has referred them to Sahara for support. Sahara could able to find a sponsor and helped Angelina in going to school. Her aunt conveyed thanks to you for your kind gesture of extending a helping hand which will go a long way for the better future of the child. With the support of sponsor she is now getting supplies for sustenance like rice, dhal, sugar, vermicelli, soaps, cooking oil, coconut oil, shampoo, toothpaste, washing powder, biscuits/fruits, educational material and cash support for school/tuition fee.